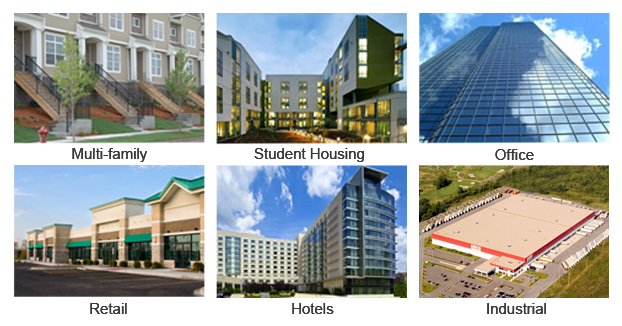 RPC offers a variety of loan types tailored to suit any commercial real estate requirement. These include permanent loans for both refinance and acquisition, construction loans, bridge loans, mezzanine/preferred equity, and traditional equity. Although we do not recommend hard money loans, we can facilitate them through a national lender with whom we have a longstanding relationship. RPC finances multi-family dwellings, student housing, single and multi-tenant office buildings, retail sites, hotels, medical offices, industrial/flex, self-storage and owner-occupied properties. Contact us today for more information about what we can do for you and your business. RPC has relationships with around eight Fannie Mae lenders who are part of the Delegated Underwriting and Servicing, or DUS, program, and possesses correspondent relationships with several of them. We also deal with a large number of HUD lenders who participate in the Multifamily Accelerated Processing, or MAP program as well as a number of Freddic Mac lenders, a few of whom have a national license. RPC has contacts at nearly all active conduit origination shops currently in existence. In most cases, we possess longstanding personal relationships with the point of contact. RPC personnel have worked in the origination of mortgage-backed securities on Wall Street, and we have originated hundreds of millions of dollars of securitized loans. RPC personnel have acted as correspondent for several life insurance companies over the years. We know the business of originating for life insurance companies intimately. We maintain relationships with most of the “open shop” lenders in the market and have access to most of the correspondent lenders as well. RPC works with union pension funds for the financing of union-constructed real estate development in major cities across the country. Generally all of the major asset classes are considered. Often these lenders offer attractive “construction to permanent” programs for larger projects. From the balance sheet bridge lenders to debt funds and even the financing arms of global industrial companies, RPC owns broad relationships across the spectrum. Typically these sources can be attractive for repositioning of assets or for non-core asset types. RPC maintains extensive relationships with local, regional and money center banks, as well as savings and loans. For loans of just about any size and structure, there is probably a bank that we know who will be right for the task. RPC deals with local credit unions and national firms that syndicate loans to over 2,000 credit unions nationwide. Credit unions play an important role in financing smaller properties, weaker borrowers and off asset types. Typically, these loans do not carry prepayment penalties. From development equity to note purchases, RPC has relationships with dozens of these capital providers. Their niche or strategy varies widely across every asset type and from development to cash flowing deals.